A recording of MOTHER DIVINE reading a collection of important and insightful excerpts from FATHER DIVINE. 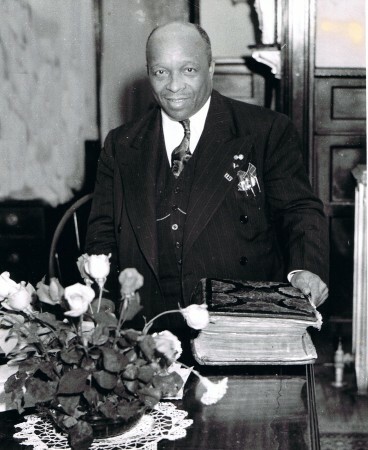 A longer video showing Dedication speeches is available on Facebook page for Father Divine’s Library and Museum. FATHER’s Library will be open Wednesdays 1:00pm-5:00pm and Sundays 10:00am-2:00pm. Other times will be available by appointment. If you would like to call ahead or make arrangements for a special appointment, call (610) 520-1841 or (610) 525-5598, or email fdipmm@aol.com or FatherDivineInformation@gmail.com. Thank You, FATHER and MOTHER DIVINE! I call your attention to the time of the great panic in the South and in all parts of this Country, around 1908 or 1909. Around about that time and right on, some people in the Southern States, women especially, were working earning one dollar a week, having to pay for lodging, and they did not live on the premises. It happened to be that there was a young lady I met, in going through the South and there were many others, but especially this one, that was earning one dollar a week. I said to this young lady as in the same case with many others. “You tell your Madam you can not work for less than two dollars, no way—just start at that.” She told her the next day and she said, “ You know you will get one dollar a week now, and when you work four weeks you will have four dollars,” and she was not even staying on the premises, but was staying with some of her friends and had to walk home. She would not pay her any more, so I said, “All right.” I put this identical lady, and many other young ladies and men and women in Agency work. I Personally did it! That was just before the great move in the South came up, just before the great migration from the South began, and I put this lady to work in Agency work. She began to earn from eight to ten dollars a day. I said, “I will bring you out,” and for many others I did it in the same way. I remember a man, a healthy, strong, robust man, working for fifteen cents a day—working in the field cutting corn, or pulling fodder, or something like that. “They said he could only earn fifteen cents a day and he worked hard. I said, “Well I will stop you.” As a first step, I got him in more public work, like in a Mill. I placed quite a few of them in the Lumber Mills. They began getting eighty and ninety cents a day. He was a foreman and a good worker, and earned ninety cents a day. They said they would give him ninety-five cents a day—five cents more, as he was a great worker “All right,” I said, ”but tell them to give you more.” They would not give him more, so I put this very man, and many others on the Agency list, and they went out and did work in that same City, and he began to earn from six to eight dollars a day. He did not earn as much as the young ladies, apparently they were better salesmen. However, I had a way there, that no man knew but MYSELF. Through working silently, apparently, and not establishing MYSELF as a Person. I made many, independent from that angle and from that point of view, and great is the Spirit in the midst of you, to accomplish anything that I teach it to do. It is indeed Wonderful! It was published in The New Day from March 29th, 1952. In Father’s private office of the Circle Mission Church, Home and training school of Pennsylvania. 764-772 Broad Street, Philadelphia, Pennsylvania. Saturday Morning, March 22, 1952 A.D.F.D. at 9:40 a.m.
Mr. Star: Peace, Father dear. Mr. Star: Father, this is brother Star in Oakland, California. Father: Yes, Mr. Star, how are you? Mr. Star: I mailed you a letter regarding that airplane trip advertised in The New Day. Father: Yes, I just see it here in my mail. I haven’t had time to read it yet. Mr. Star: Father, the company said they got an interview with you and I want to get your approval on it, that you said we could go on with them. Father: On the airplane trip? Mr. Star: They said they saw you and had a talk with you. I mailed the telegram to you and we want to get your approval to see if it is correct or not. Father: No, I haven’t seen them personally. Mr. Star: Well, we just wanted to find out if you approved of that ad and we wouldn’t want to travel on that plane unless we get your approval. Mr. Willing Heart said for us not to pay any attention to that ad in The New Day because that ad is nothing but a false. So we don’t know what to do, Father, whether we should make reservations with Mr. Willing Heart or with the company in The New Day? Father: Well, I did not put the ad in. Mr. Star: I see, Father. Father: I just saw the ad the same as anybody else and I have not been personally interested in the ad. I haven’t been travelling by plane. Mr. Star: I see Father dear. Father: It is up to the individuals, whomsoever wants to travel that way. Of course, it must be authentic since it is in The New Day as a public advertisement. Mr. Star: I see, Father dear. All right then, we want to co-operate with Mr. Willing Heart. Mr. Star: Is it all right to go with Mr. Willing Heart? Father: Well, it doesn’t make any difference to me. Mr. Star: Well, myself, I want to do what you say, Father. I have your spirit, but then I want to know if the Sky Ticket is okay to travel with? Father: It is up to the individuals to travel in any way they choose – in whatsoever way would be the most reasonable to go – whatsoever they would prefer. Mr. Star: Yes, Father dear. Father: I don’t bear record exactly which would be the most reasonable for them. Mr. Star: I see, Father dear. All right; that is why I called because I wanted to get firsthand information from you, God Almighty. It is not because I am in doubt of myself to fly in the air, on land or anything, but I did not want to go against your spirit or your wishes. Mr. Star: So that is why, Father dear, I wanted to hear from you. Father: Well, so long as everybody is in harmony with my mind and spirit and will do the thing that is the most practical and profitable and the most constructive, it would be all right. Mr. Star: All right, Father dear.